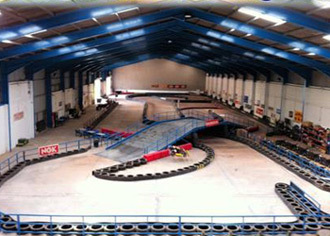 Go-Kart circuits are few and far between in the West Country but Raceworld is the ideal venue if you're in the area. Rimo Karts and Clubspeed Computer Timing ensure that your event, be it a Grand Prix, Endurance or an arrive-and-drive session, is run like clockwork and the enthusiastic team will provide an event to remember. Please note that crash helmet liners are compulsory and can be purchased from reception. Ten minutes practice/qualifying to determine your grid position followed by a 20-lap race. A two-hour team endurance event. 20-minutes qualifying to determine your grid position then a non-stop 120-minute relay event for teams of 2 to 4 drivers sharing a kart.